We often receive requests to build arrangements in mason jars. My first response is to try to discourage the customer from even considering using mason jars. Sure, they’re often free vessels (saved from food products or other projects), but unfortunately, they don’t allow the flowers to do their jobs. Here’s what I mean. Consider this diagram. Because flowers have long thin stems and a mass (the flower head, petals, etc.) at the top, vessels that are cylindrical and narrow cause the heads of the flowers to be packed in tightly together. This is why there is a bit of an art form to designing bouquets, too. If all the stems were just packed in vertically and parallel to each other, you’d have none of the beautiful splaying of blooms and stems that allows each botanical element to shine. Mason jars generally do not work well for centerpiece arrangements, either. They are just tall enough that when filled with flowers they can pretty much block everyone from seeing across the table. THESE jars are great for making small centerpieces to place down the length of a farm table. You’ll be surprised how many flowers you can fit in them. Why do these jars work better? They are short (to allow for conversation across the table). They have a wide mouth, but they also have a lip that catches the ends of the stems and holds them under the water line. And, because they are so low profile, you can actually build “floating” arrangements in them instead of in plastic dishes with floral foam. By “floating” I mean that the vessels pretty much disappear below the floral arrangement so that you have a more organic looking design. 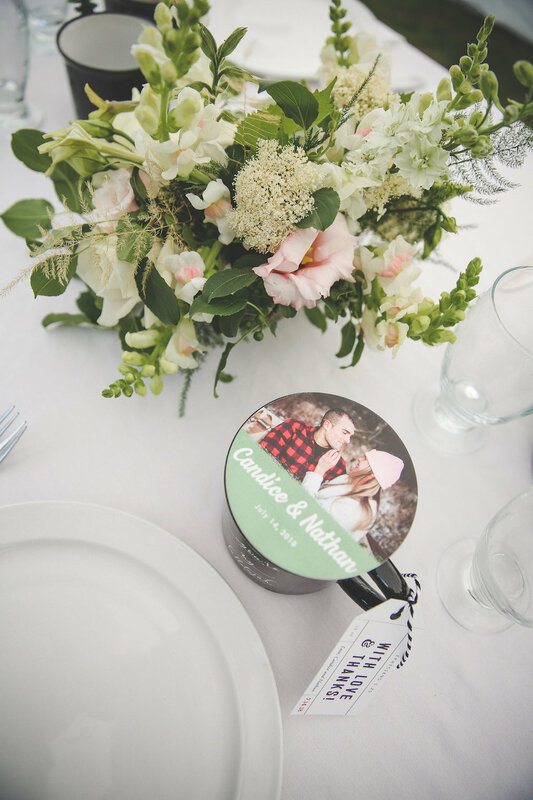 Check out these designs from Candice and Nathan’s wedding this summer. I built them in Ball half pint jars. Photos by Heather Gallagher. I hope this little note was helpful. If you’re thinking of designing with flowers for a DIY event I recommend taking several different vessels for a test drive. See what works and what doesn’t. Older PostDIY Wedding Flowers? Tips Here!